A patent technology used by aircast provides compression cycles where by mixing cold water in the cuff and maintaining required pressure on your joint. This pressure is created by air in the outer wall of the cuff with the help of a motor fitted in the lid of the cooler. 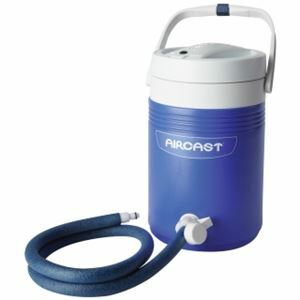 Aircast Cryo/Cuff IC cooler feeds water through gravity and air with motorised cold & compression for prolonged relief. The Ic cooler can be used with any of the aircast cuffs. The motor of the cuff pumps air into the cuff to create a compression and this happens in interval of 30 seconds. The Non Motorized unit uses gravity feed to create that compression in the cuff. A fill it shut it and use it operation means you don’t have to keep refilling ice agin and again. The motor pumps air for 45 sec and the shuts off for 30 seconds to create automated operation for compression. The lid comes fitted with a pneumatic pump. I live in remote Vancouver island and i got it delivered at my door step. Easier to manage. It is like fill it! Shut It and forget it. Fill it once with water and let it generate ice water for you to recover way better then Ice pack and works very well. I Ordered the product and they were out of stock. Got a call from support. They said stock will be in 3 business days, I was kind of nervous but I did get my product and am very happy with it. What a service for Toronto Area. First online company to deliver in one business day!!! I placed my order on a Tuesday and I received my product next day at 12 PM. Excellent and works like a charm saved me over 100$ for the IC cooler. Now that is a wow!!! I have a knee replacement and this is something which worked for me. I am using it twice a day and it really helped me to recover and get back to normal life. The cooling effect speed up the healing process and minimized the pain and swelling. It is simple to use and portable. I can take it with me when I travel. Best device for getting relief from pain,swelling and swollen joints. Its cooling effect put the required pressure which eases pain and swelling. This cryo/cuff is easy to use, comfortable and handy. Definitely recommend this device. It worked exactly the same as described in your website. A wonderful product for reducing post operative pain and swelling. Moreover, it helps in regaining the motion and enhancing the circulation. An ideal product for post operative recovery as it speeds up the healing process. An excellent product. Very effective,comfortable and easy to use device. Best for healing joint pain and swelling. Worth paying product. It brings down the swelling and helps to ease the everyday pain.